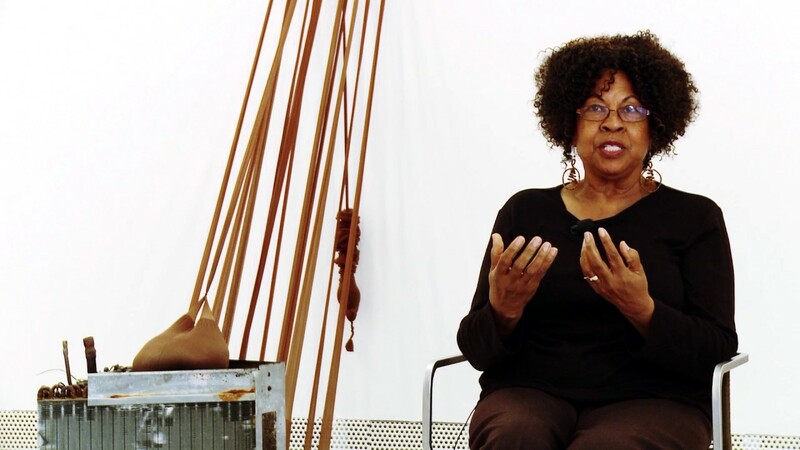 On the occasion of the closing day SENGA NENGUDI—IMPROVISATIONAL GESTURES, a day-long symposium presented in conjunction with the exhibition will take place this weekend at CAAM and USC. During the morning sessions, Nengudi will be joined by Selma Holo, Chelo Montoya, Elissa Auther, Uri McMillan, Grant Johnson, Barbara McCullough, Isabel Wade, and Maren Hassinger. After lunch, Nengudi’s work R.S.V.P. will be performed, and the afternoon session will conclude with the roundtable “On Activism and Performance,” with Nengudi, Rafa Esparza, Patrisse Cullors, and Nao Bustamante, moderated by Suzanne Hudson. SENGA NENGUDI—IMPROVISATIONAL GESTURES, through April 14. SYMPOSIUM, Saturday, April 14, from 9 am to 4 pm. CALIFORNIA AFRICAN AMERICAN MUSEUM (morning sessions), 600 State Drive, Exposition Park, Los Angeles. FISHER MUSEUM OF ART, USC (afternoon performance and roundtable), 823 West Exposition Boulevard, Los Angeles. Senga Nengudi, R.S.V.P., 1977, photograph by Herman Outlaw; and (bottom) Nengudi at the 57th Venice Biennale, in 2017. This entry was posted in CONVERSATION, DANCE, EDUCATION/ACTIVISM, PERFORMANCE and tagged Barbara McCullough, Breeze Banks-Smith, California African American Museum CAAM, Chelo Montoya, Cheryl Banks-Smith, Elissa Auther, Fisher Museum of Art USC, Grant Johnson, Isabel Wade, Maren Hassinger, Nao Bustamante, Patrisse Cullors, Rafa Esparza, Selma Holo, Senga Nengudi, Senga Nengudi - Improvisational Gestures, Suzanne Hudson, Uri McMillan, USC on April 12th, 2018 by Barlo Perry.